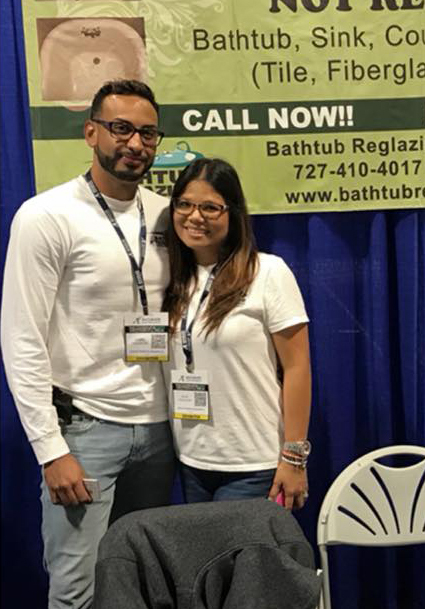 Bathtub Reglazing Specialist Inc is a family-owned business proudly serving Tampa Bay, Orlando/Central Florida & Naples/Ft Myers Areas. We pride ourselves in the quality of our work and strive to be the best company in our industry. Meeting our customer’s needs to their satisfaction is top priority. Rest assured, our goal is to provide excellent service, and ensure our customers are content every time! Today, refinishing is one way to remodel any bathroom or kitchen without spending thousands of dollars. Customers can save a fraction of the total cost of removing or replacing tubs or tiles. It is a convenient way of saving time and money for many of us. The completed job can sometimes be done in less than a day and ready to use within 24 hours. We can repair any ugly, worn-out, rusted tubs without any hesitation and return it by looking like new. Variety of colors such as granite hues are now available to use for any tubs, tiles, counter top, and many more. Therefore, restoring them can now be easy by simply calling Bathtub Reglazing Specialist Inc.
Bathtub Reglazing Specialist Incorporated uses technologically high advanced tools and top quality coatings to refinish any bathroom and kitchen. The high solid acrylic polyurethane enamel is used as a finishing coat for porcelain, fiberglass, ceramic or any industrial use; resulting the bond between the old and new surfaces of your tub. As the company’s policy, all works are guaranteed against poor workmanship. We will fix your refinish surface with no additional cost as long as it’s under the terms of warranty. Unfortunately, this does not cover man-made damage or negligence on the part of the user. Please follow the instructions provided to you by the technicians. This will help you understand what governs our policy.